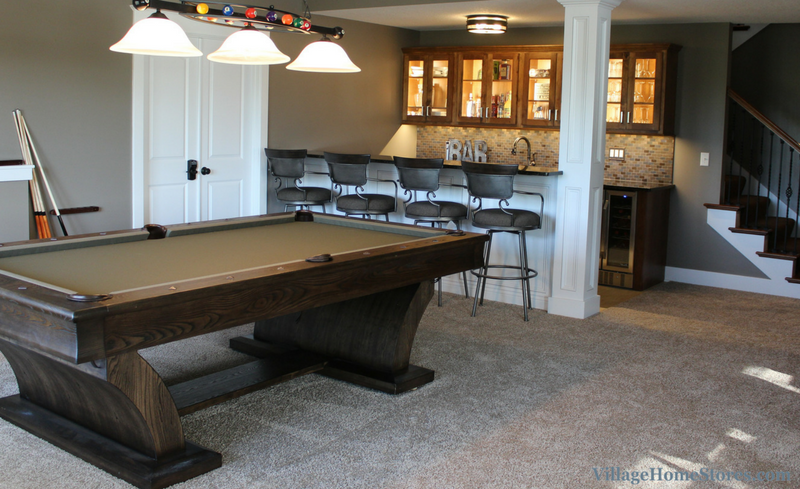 The past two tours here on the blog have been from a home in Davenport, Iowa we just completed a remodel at. This is a beautiful home that is still fairly new. 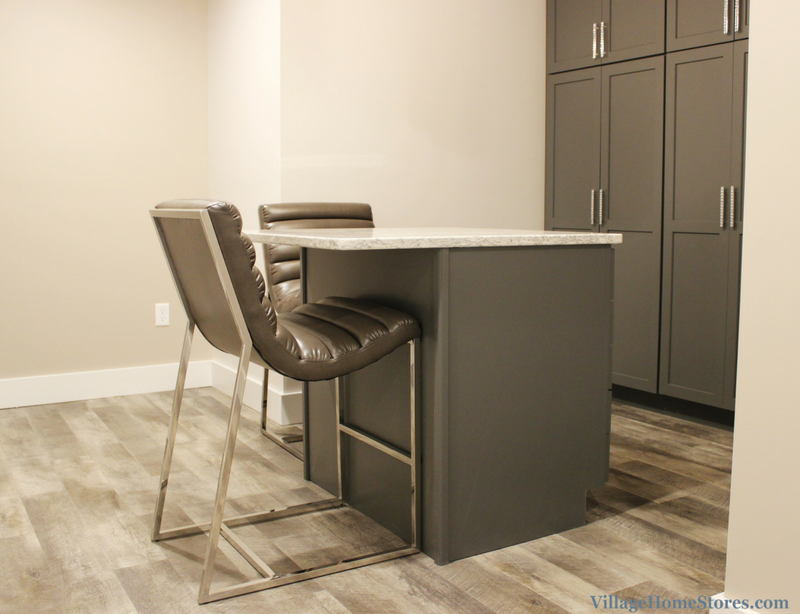 The lower level of the home however, was ready for the final touches to customize the spaces perfectly for the owner’s lifestyle. We now wrap up our features with two spaces in the lower level that are unique and amazing! 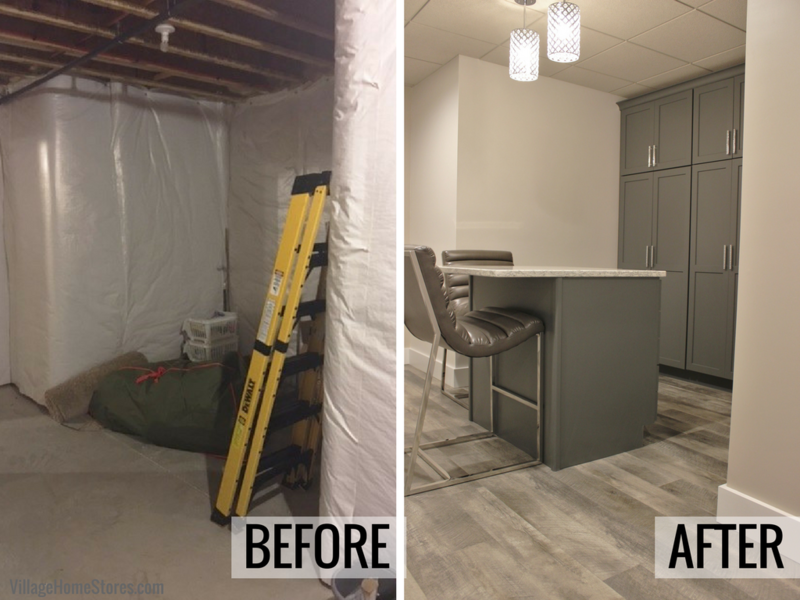 Take a look at this before and after of a storage room turned craft space. What a dream area for any creative! 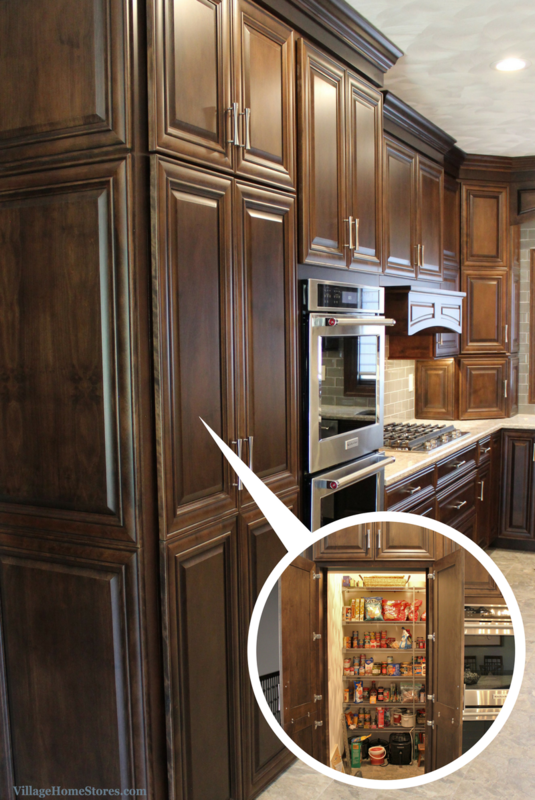 Tons of added storage space in tall pantry cabinets that can accommodate boxes, bins and containers of all sizes. 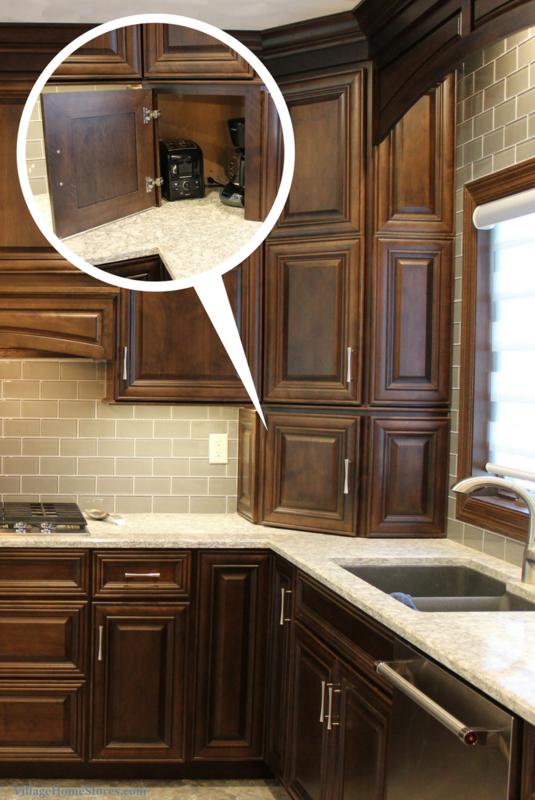 All of that tall, deep storage space plus an island area for a worksurface. This space will be used for crafting and sewing projects. We honestly wouldn’t mind any task as long as it can be done in this gorgeous room. 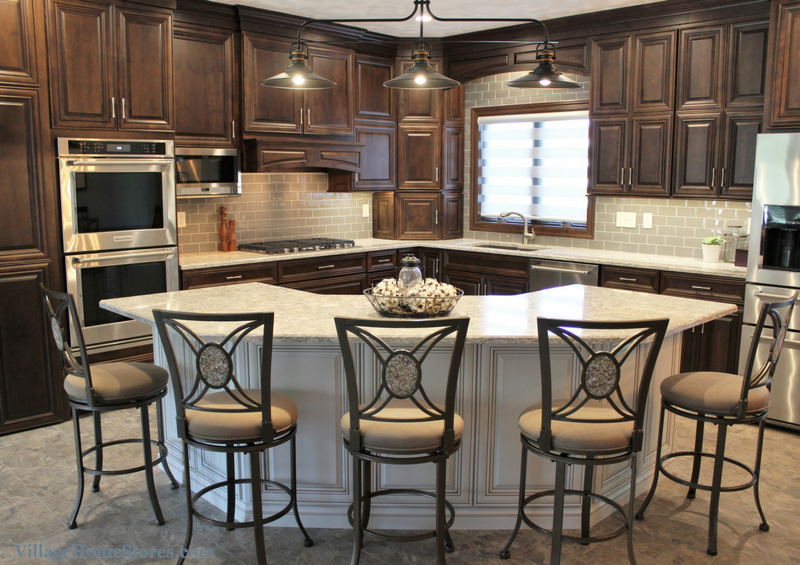 One side of the island has an overhang of countertop so a stool can be pulled up beneath it when seated to sew or work. A second “floating stool” can be pull up on any other edge of the island if needed. 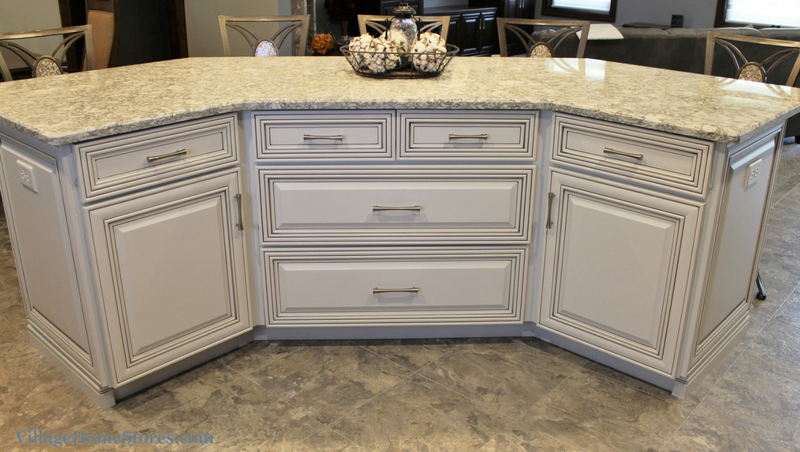 Cambria Quartz in the “Berwyn” design is truly the very best surface you can ask for as a craft table! Quartz will not get damaged if your hot glue gun happens to drip down, it is nonporous, and you can even cut directly on it. 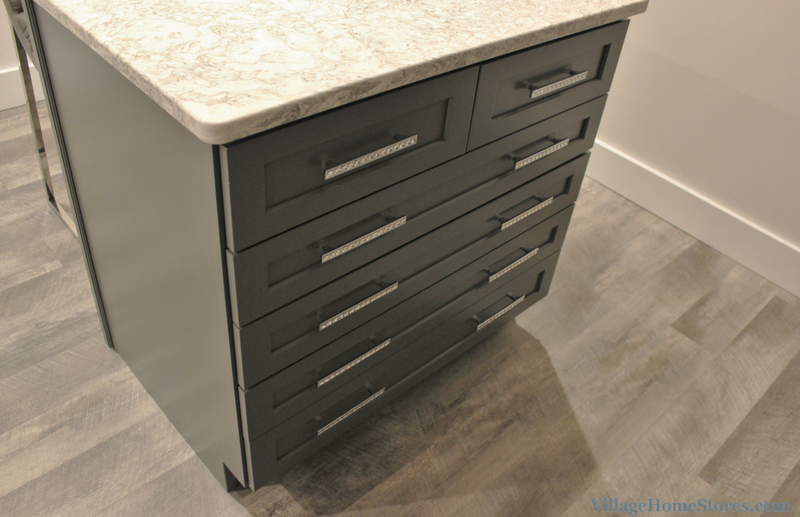 The island is built from a single drawer base cabinet including a total of 6 drawers to help sort and organize tools and supplies. 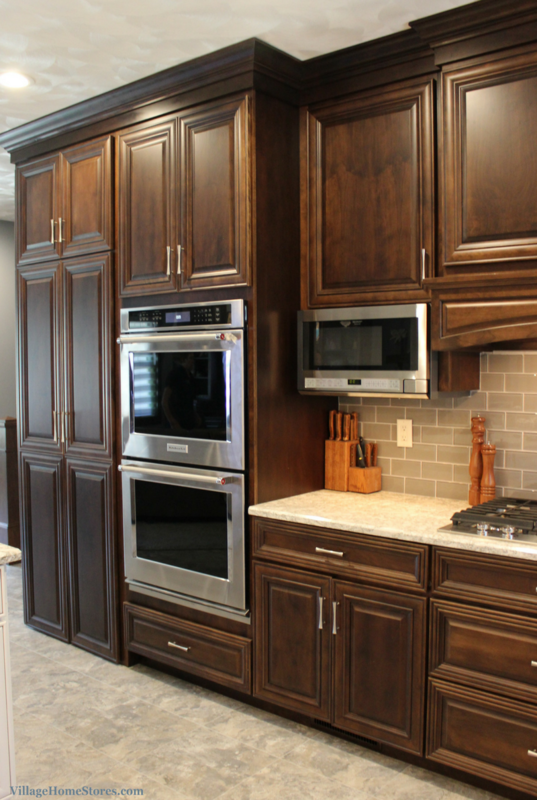 The cabinetry in this Craft Space is from our Dura Supreme line. 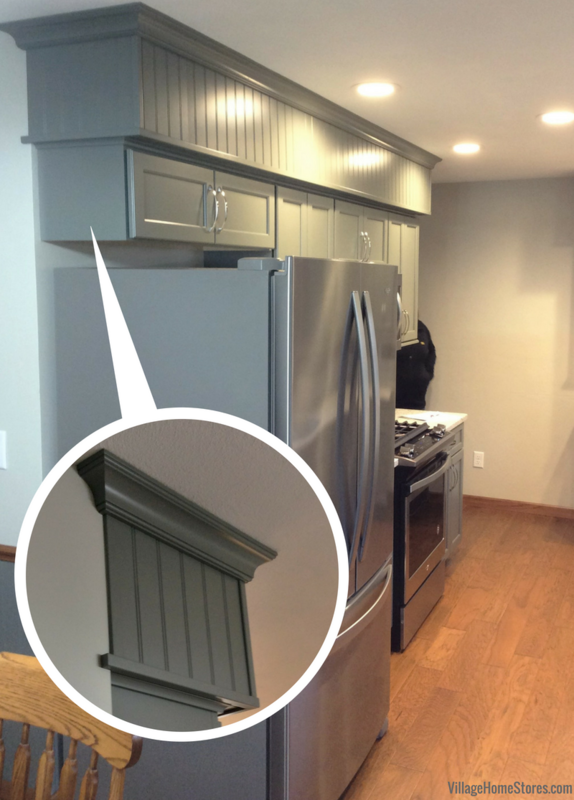 The Shaker door is painted in a gray “Storm” finish. 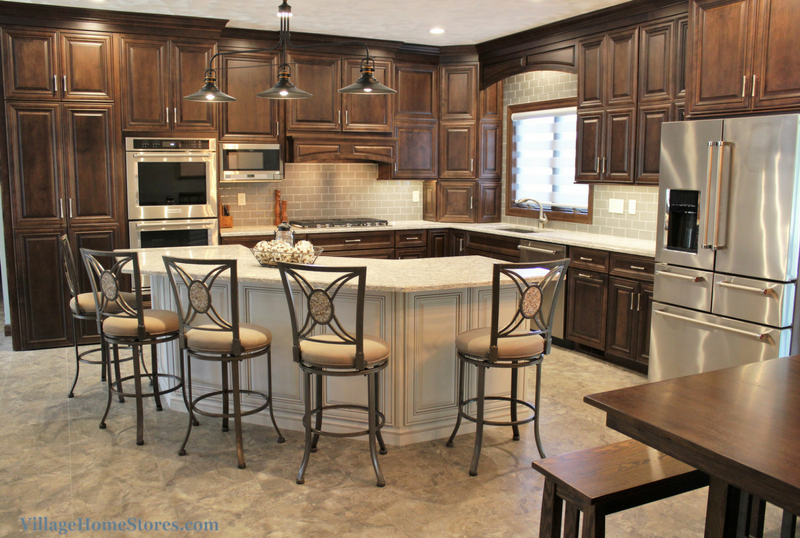 We love how it pairs with the counters and flooring. 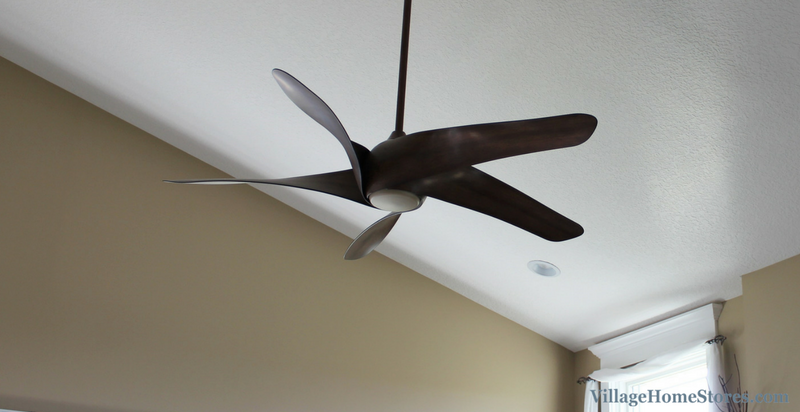 All of those specialized “extra” spaces of a home is what makes it a home after all. For instance, why get a gym membership if you have this space downstairs?!? 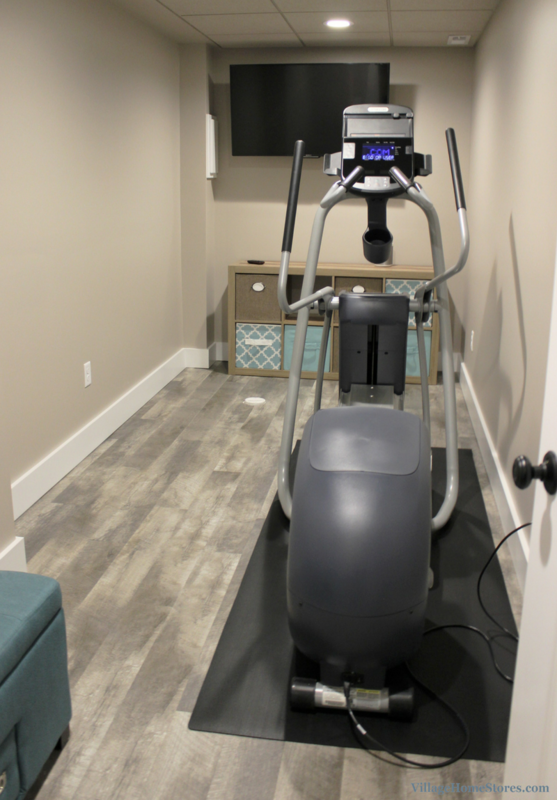 Home Gyms are a great investment an can be placed in sometimes previously-unused spaces. This room was just a storage alcove a few months ago. Now it is a perfect Home Gym escape! 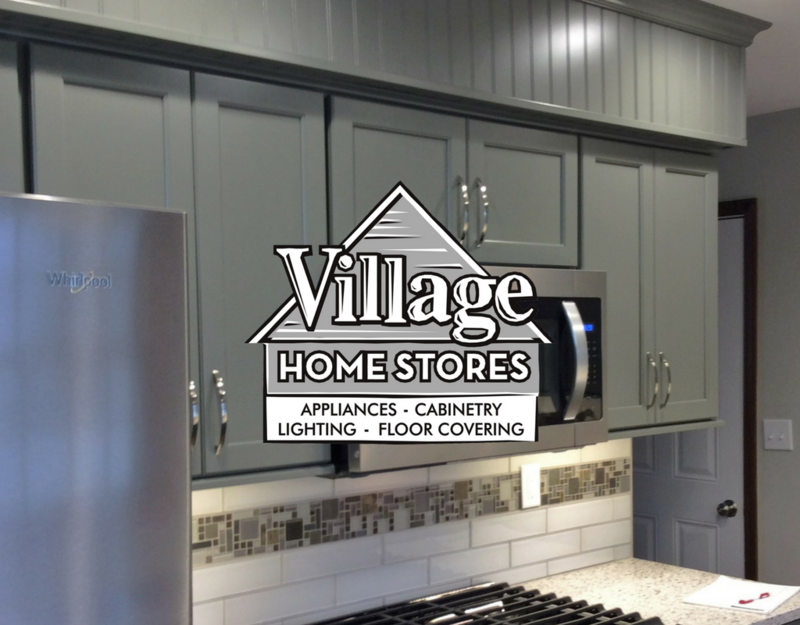 A Luxury Vinyl Plank floor from our Adura line is installed here and all through the hall and Craft Room as well. 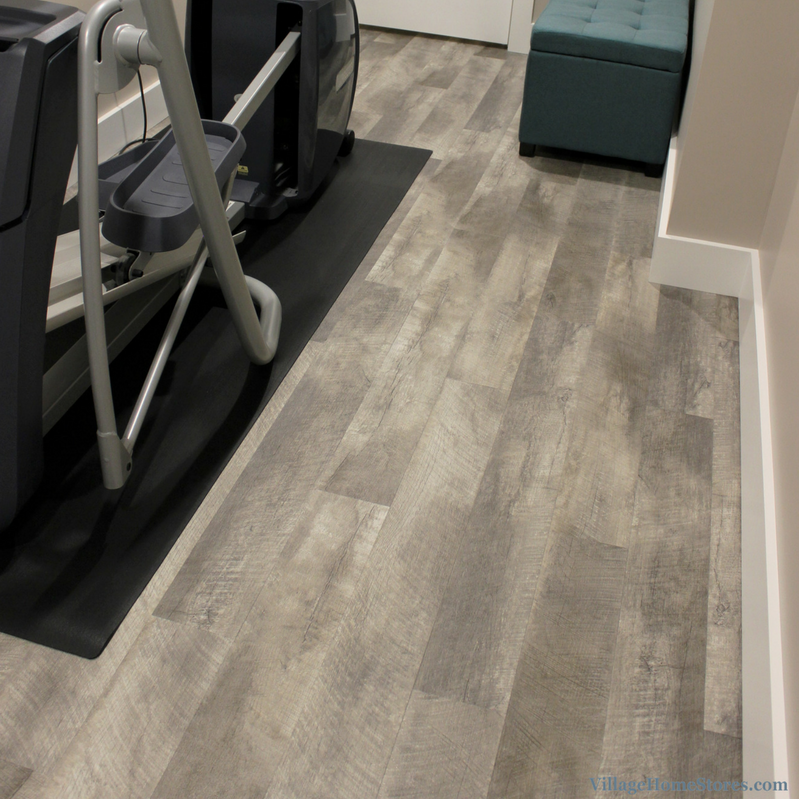 Adura Distinctive planks that are 6″ x 48″ in size in the Seaport Wharf color. 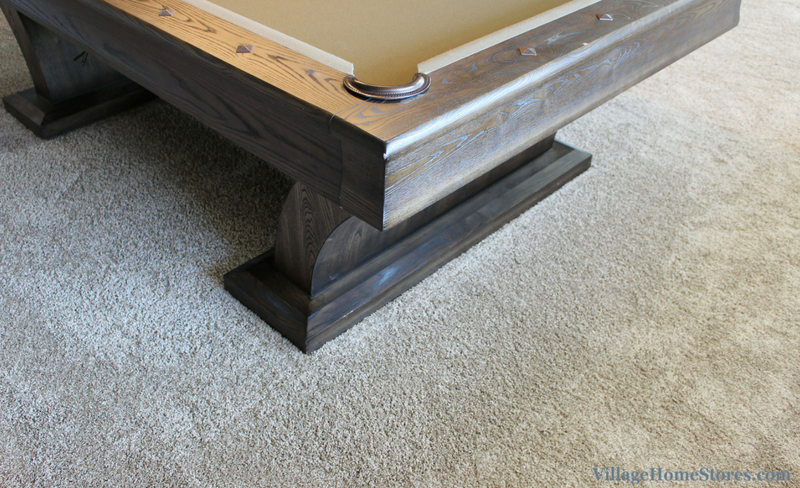 Vinyl plank floors are great for spaces like this. They are durable and more warm on bare feet that ceramic tile. 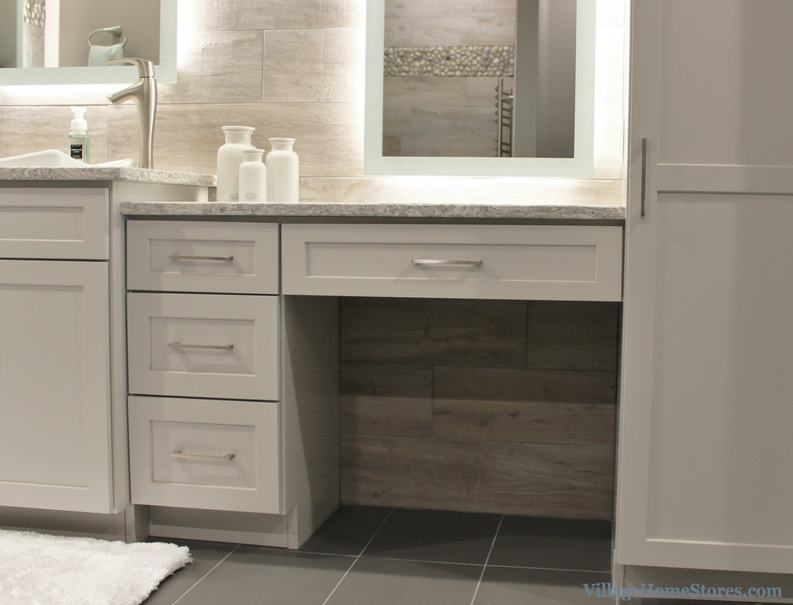 See the stunning spa-like bathroom here in a past blog feature. Plus don’t miss the Bar area we also featured here. 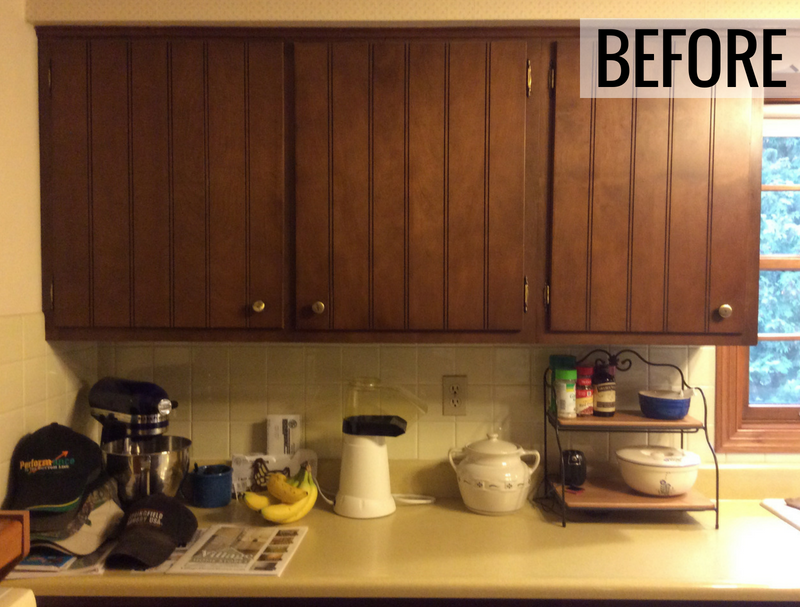 See the full album of photos from the entire remodel here on our Houzz page. 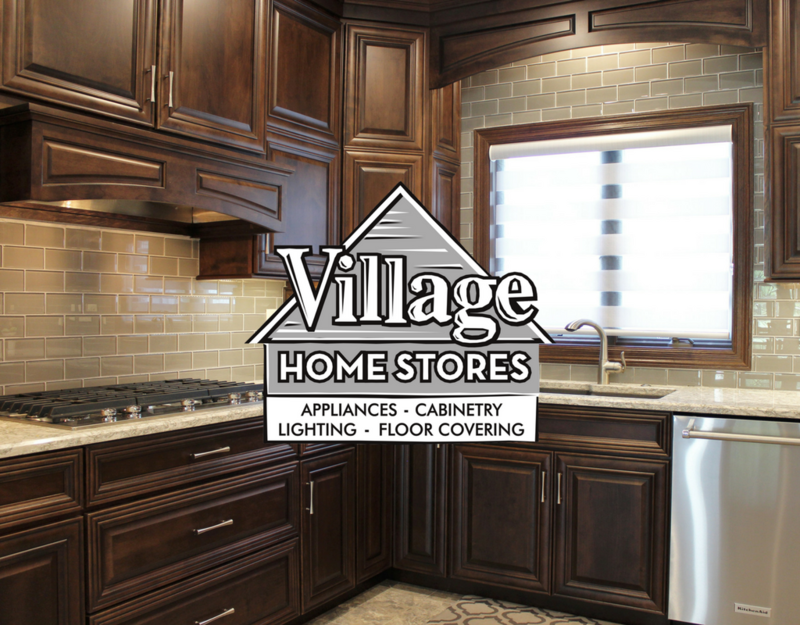 If you have a space in your home that isn’t a kitchen or a bathroom don’t forget we are still here to help! 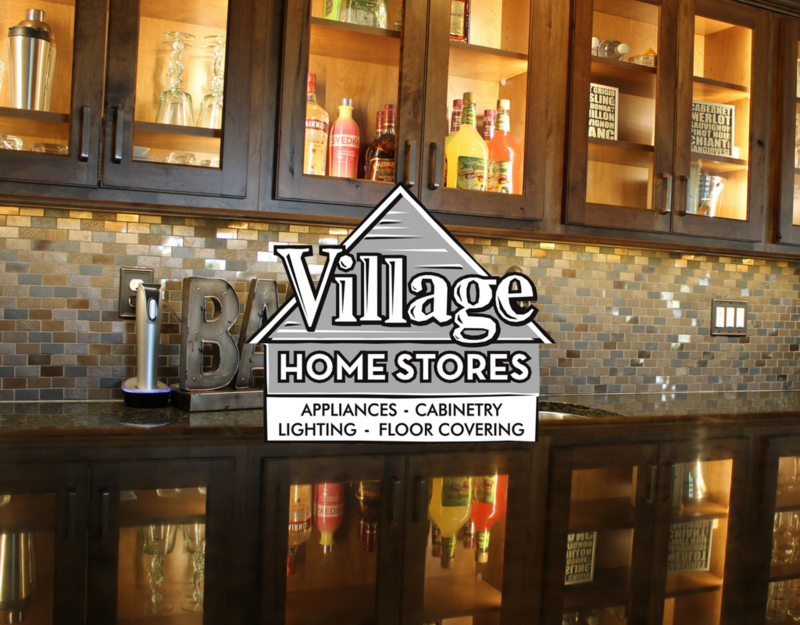 We have surface, storage, and decorative products for all around of your home! 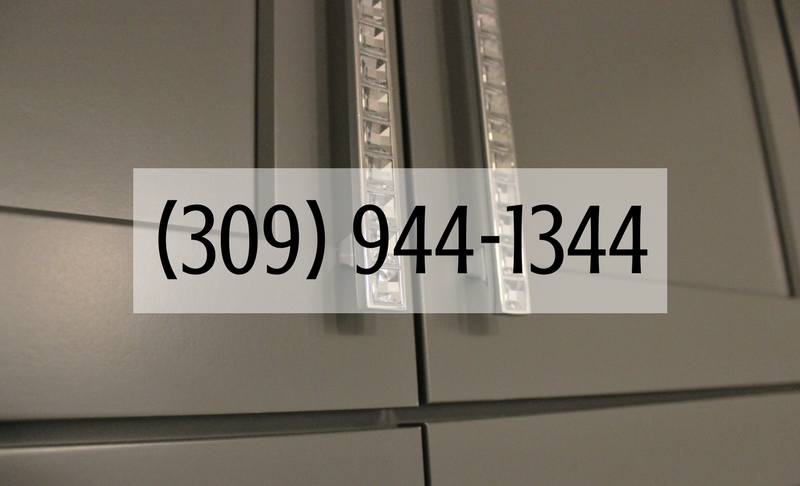 Contact us today to tell us what you are working on! 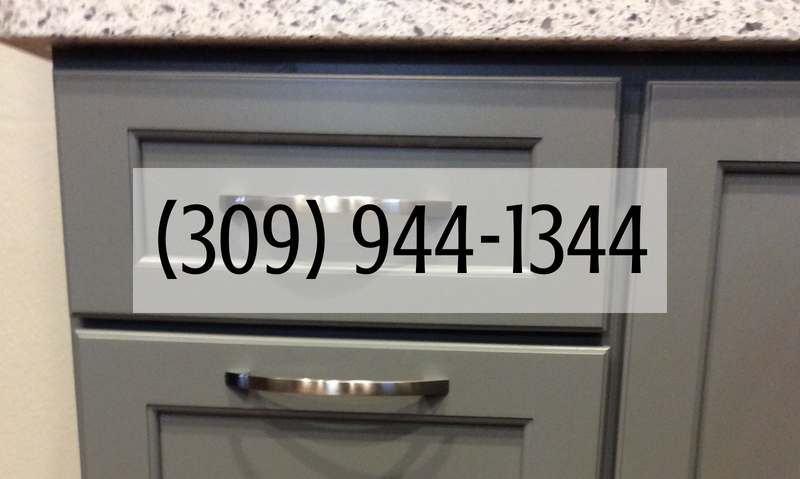 Reach us by calling (309) 944-1344 or by completing this short online form. We can’t wait to hear what you are working on! Just beyond the bedroom door of the Home Bar we shared in the last post, is a bedroom suite with a stunning new bathroom. This space immediately fools you into believing you have just checked into a 5-star Spa. A warm-gray palette and a jaw-dropping lighting statement make this one of our favorite projects of 2017! We think after you take a look around you will agree. 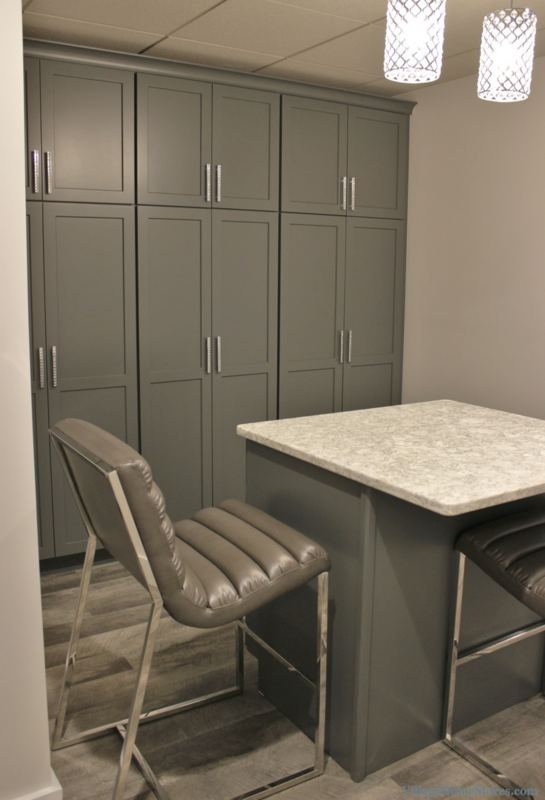 DuraSupreme cabinetry in the Shaker door and painted “Pearl” finish have been designed to offer as much storage as possible for the space. 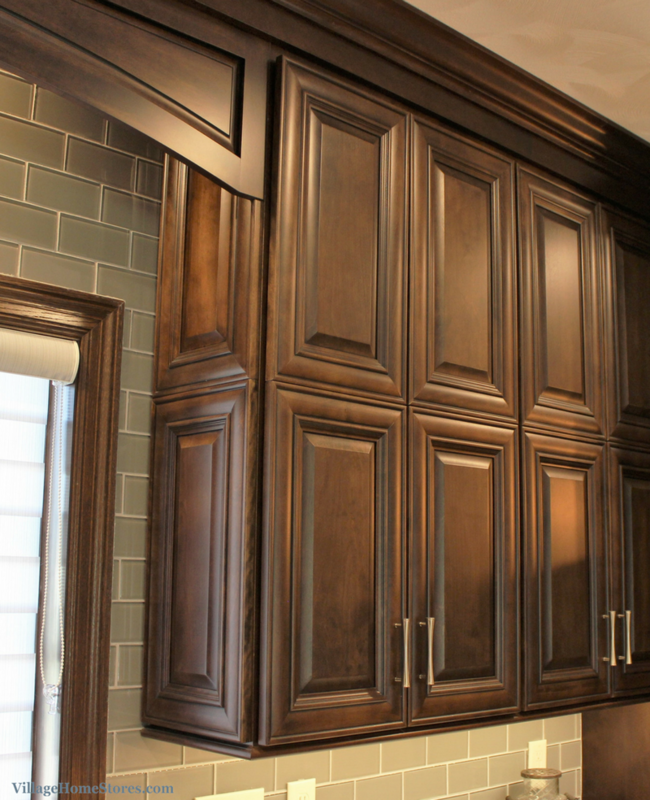 Stacked crown molding reaches all the way to the ceiling and plenty of drawer storage is within reach of either sink. 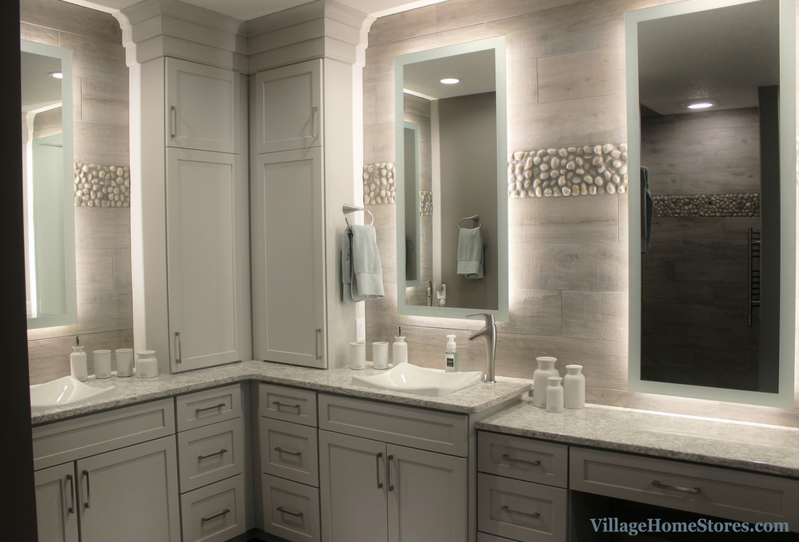 The most remarkable elements in this finished design are the lighted mirrors. 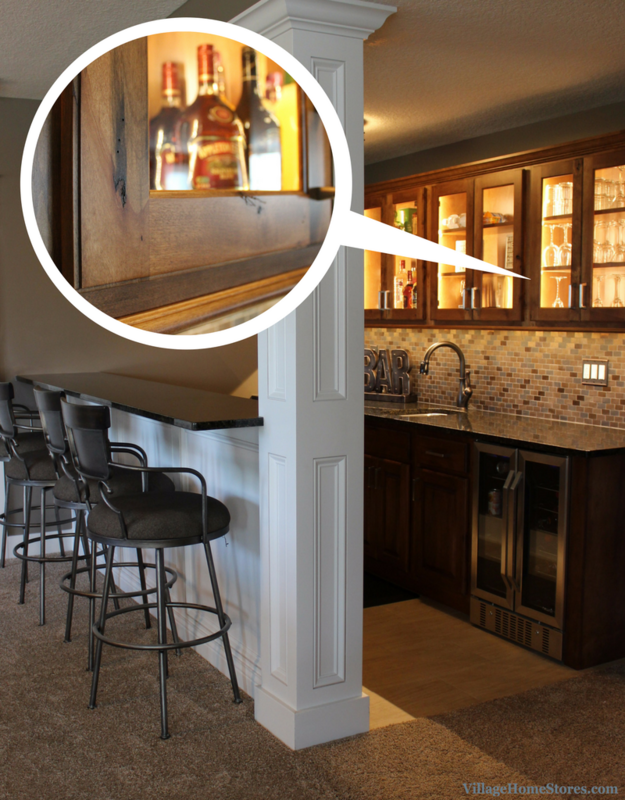 These back-lit mirrors were an idea our client had hoped we could ingrate into the design. 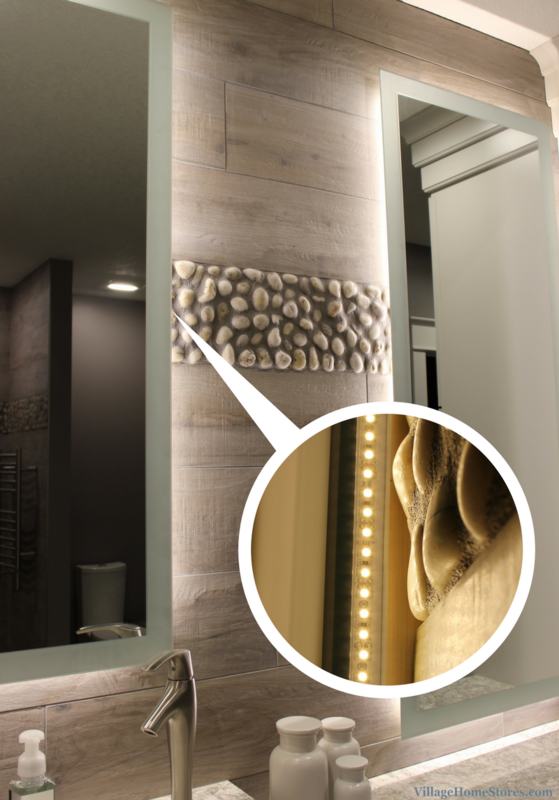 Custom mirrors mounted with our Diode LED lighting behind them turns out to be a match made in heaven! 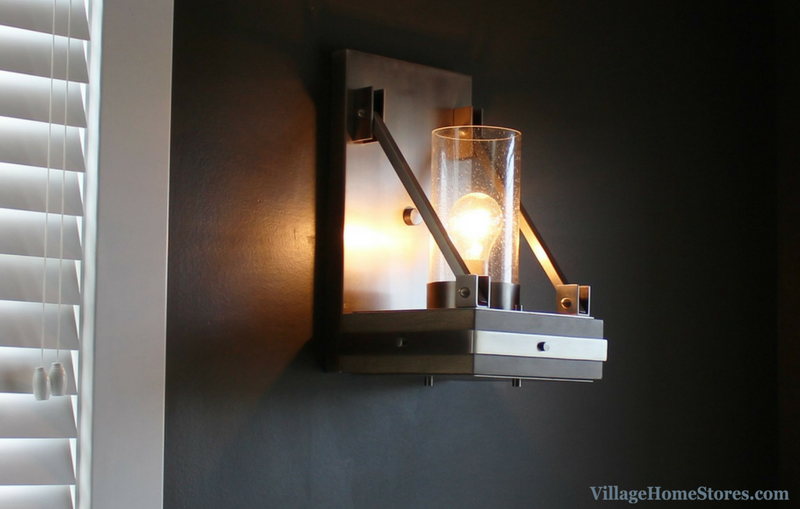 Proof that if you have an idea for your dream space… just ask! We have the resources to try our very best to make it happen. Clear communication of your budget and timeline is always key. 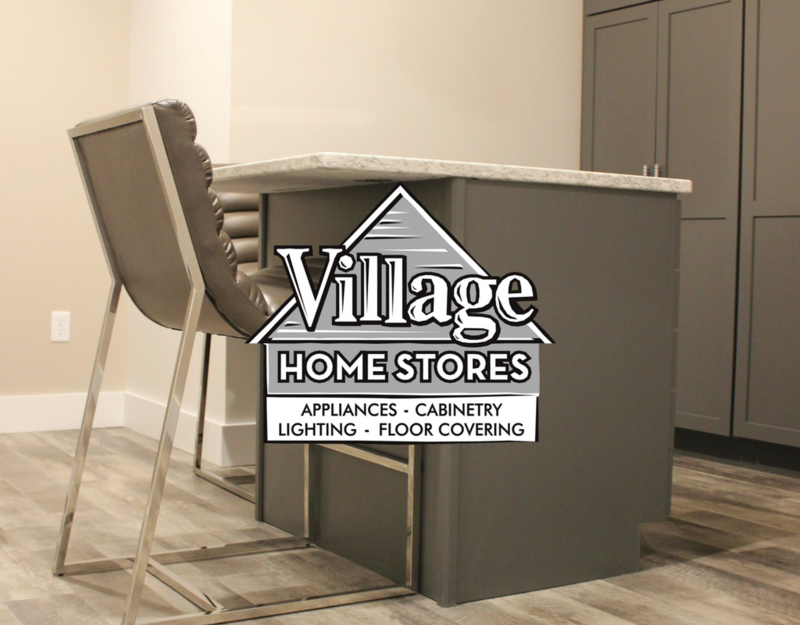 Your team at Village Home Stores can help you decide what elements of you “dream” spaces are a must-have items for the overall look and budget or if there are alternatives. 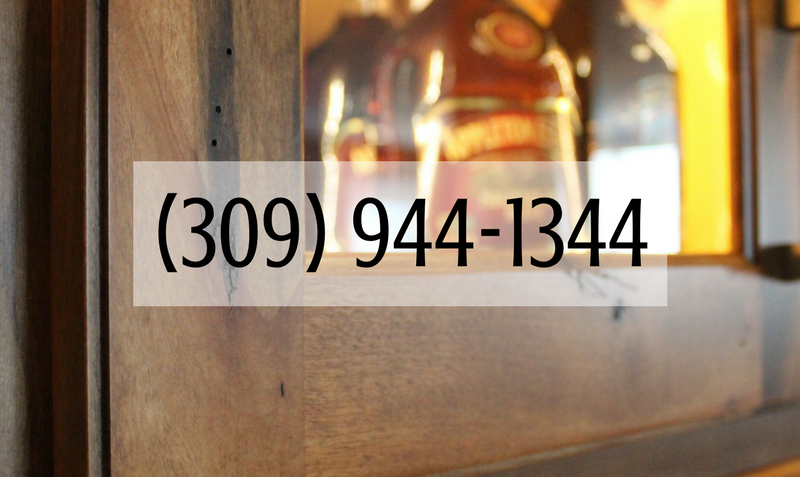 We want to keep you on track AND on budget. 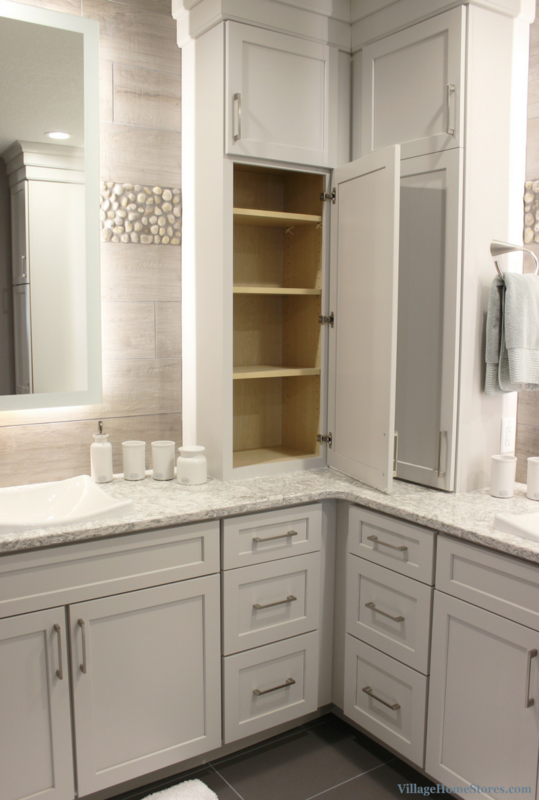 The cabinetry in this bathroom was ordered with what is called “five-piece drawer fronts” to give each drawer the added detail of rails and stiles. 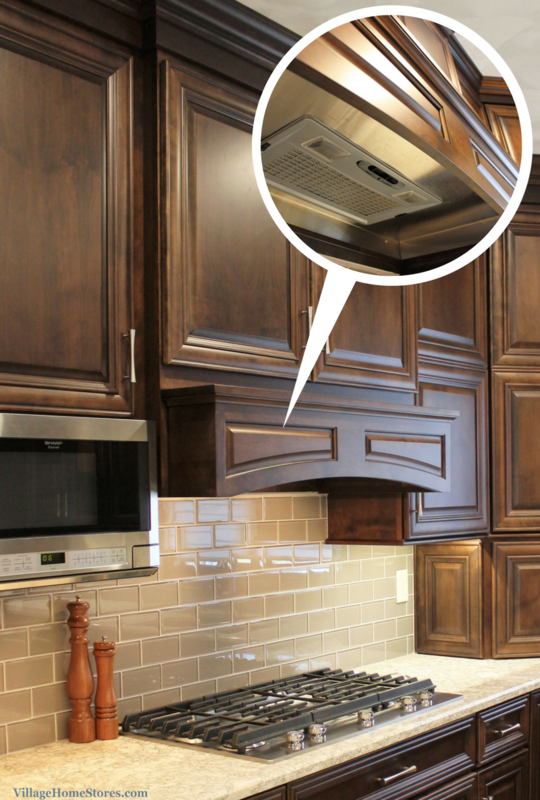 Of course what you can’t see in these photos are other features like dovetailed drawerboxes, self-closing drawers, and soft-close doors. The area shown below is installed at a lowered height and now is fit for a seated makeup vanity area. Bathrooms can be such a unique canvas for a stylish space. 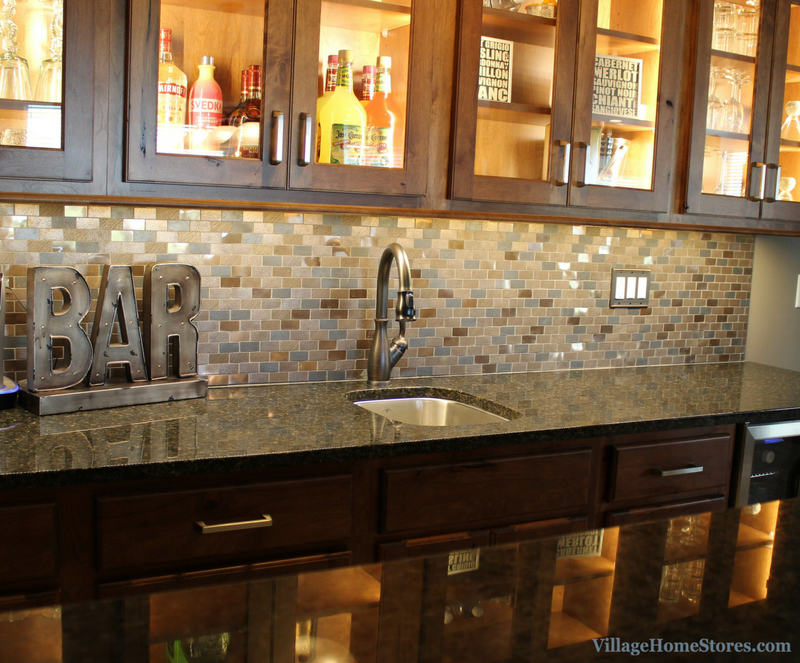 There are so many surfaces and fixtures that can add to an overall finished design. 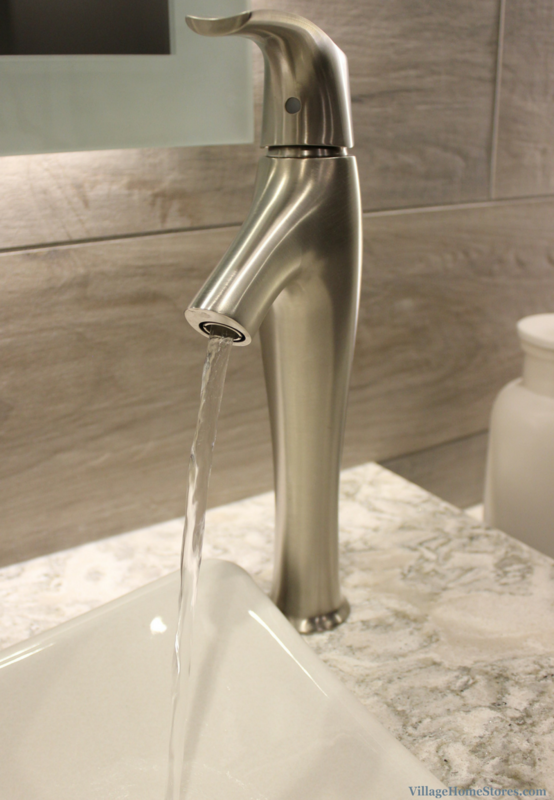 The Kohler “Symbol” faucets are absolutely gorgeous in this bathroom. They are mounted aside a Demi-Lav sink perfectly named “Wading Pool”. 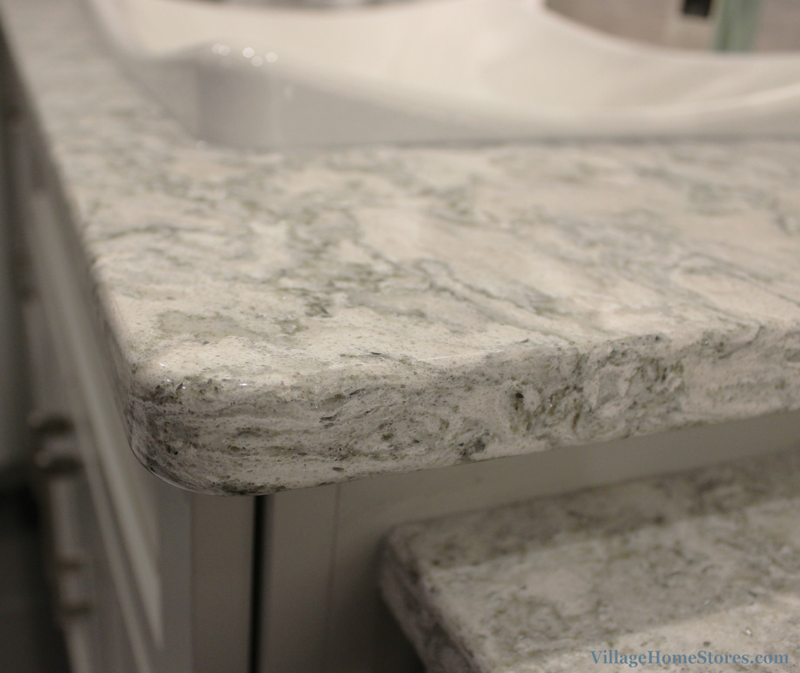 The vanity areas have Cambria quartz counters in the “Berwyn” design and standard Eased edge profile. 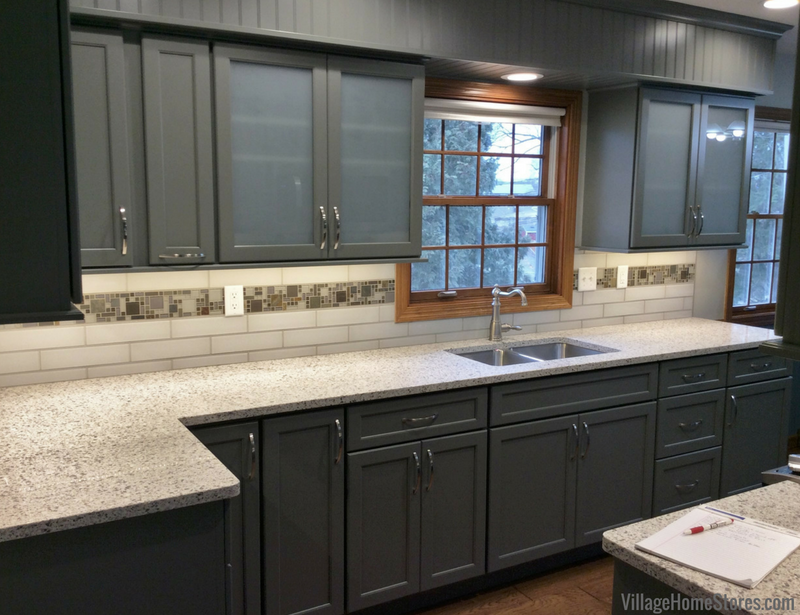 Quartz is a fantastic choice for a bathroom counter because it is stylish and extremely durable. Heat from hair appliances and makeup solutions and removers are no threat to the sparkling surface. Read more about the quartz investment in this previous post about our recent trip to Cambria. 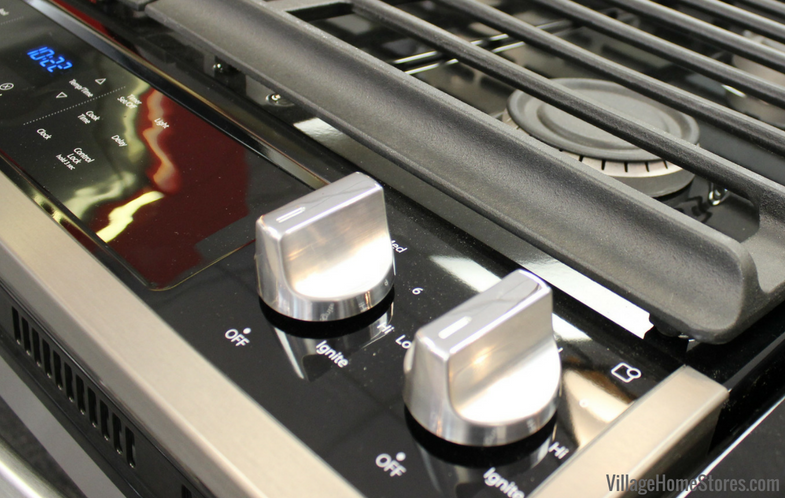 Berwyn includes so many colors that are right on target for trends in the Kitchen & Bath industry. 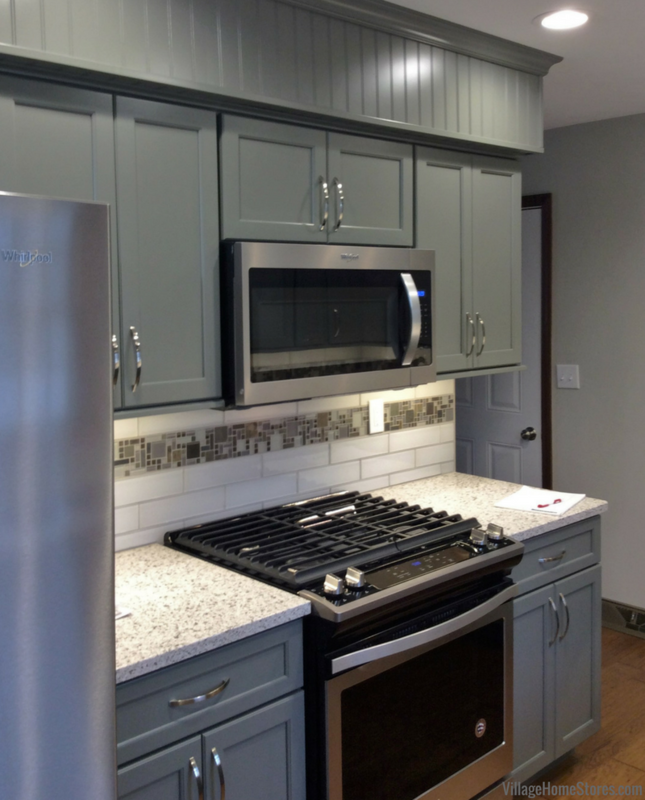 It pairs so well with bright whites and nearly all varieties of grays. 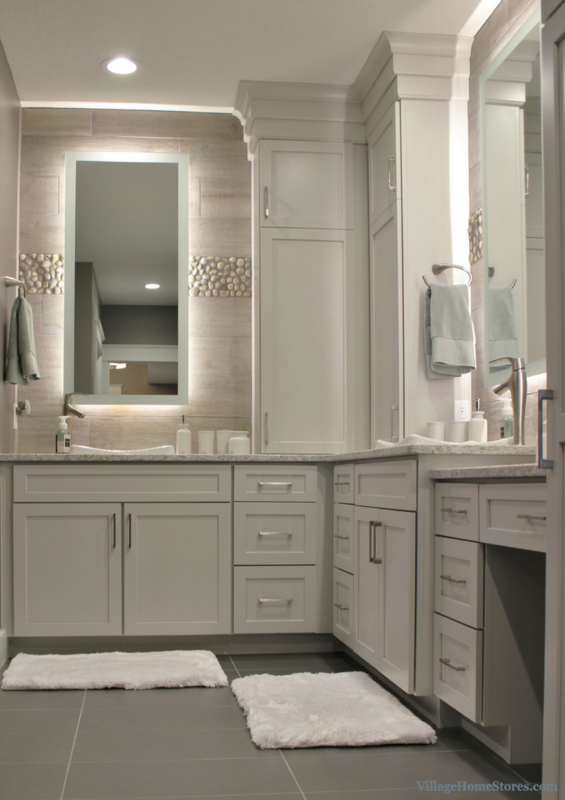 A large walk-in tiled shower is always at the top of many bathroom wishlists. 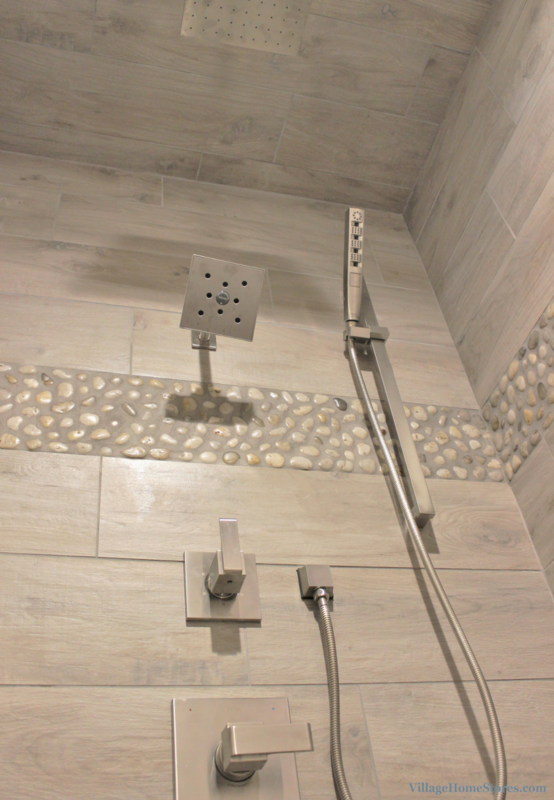 Take a look at the finished shower in this bathroom! Because of the layout, a shower door isn’t needed. In fact there is even a turn in the shape to offer the user privacy. Right at the entry is a towel bar that warms your towel as you shower. 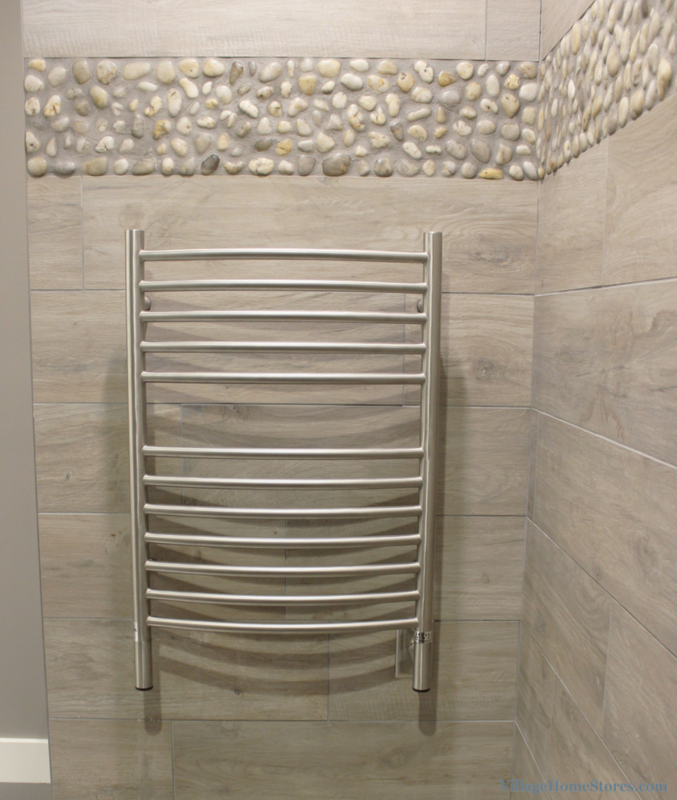 The Jeeves E curved towel warmer is the perfect treat-yourself detail for a shower like this. 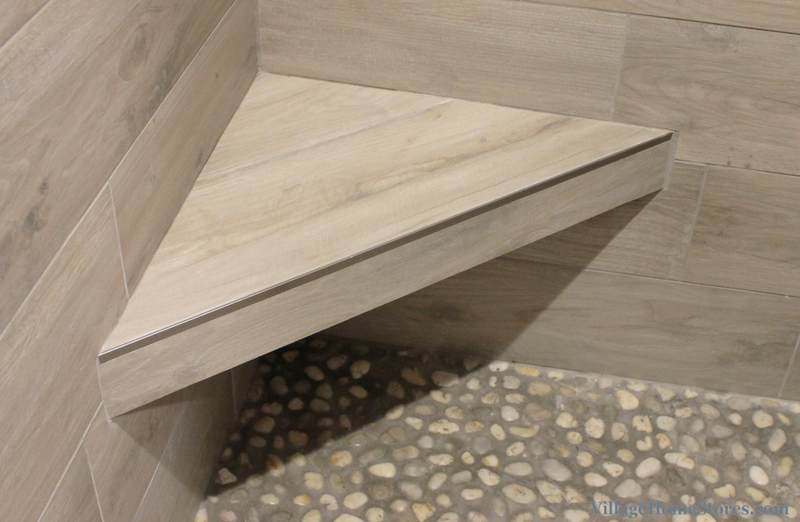 8″ x 32″ woodlook tile from the Woodland series in “Rectified Maple” is paired with accents of a Pebble mosaic tile in the Fiji Cream color. 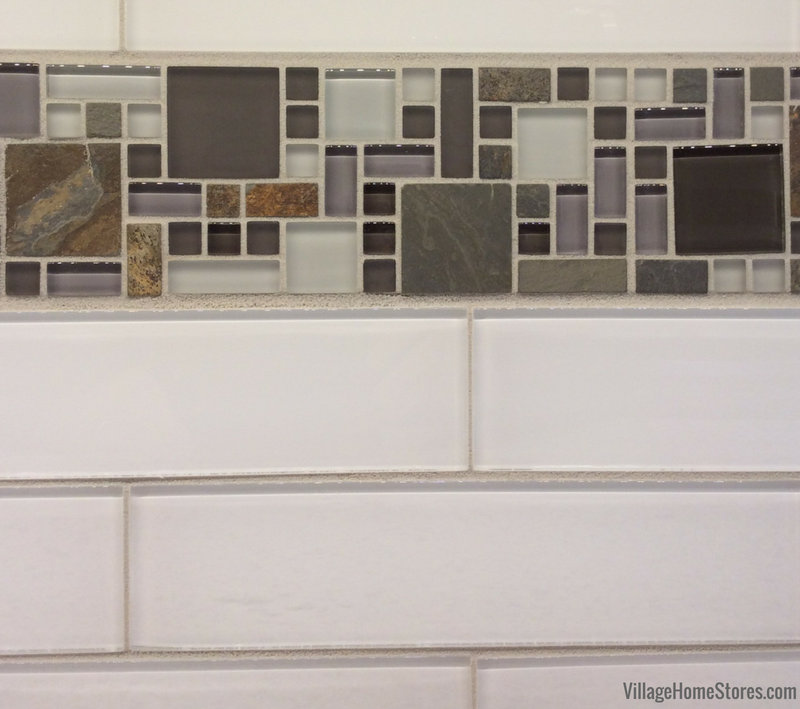 The tile from Sunderland Brothers looks perfectly on-trend and unique while still remaining neutral. 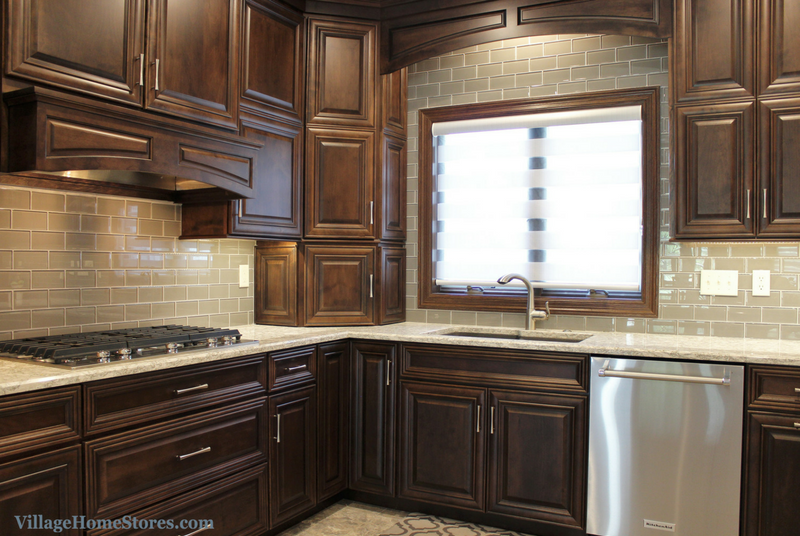 Woodgrain tile gives you a unique look in an easy-toclean surface. 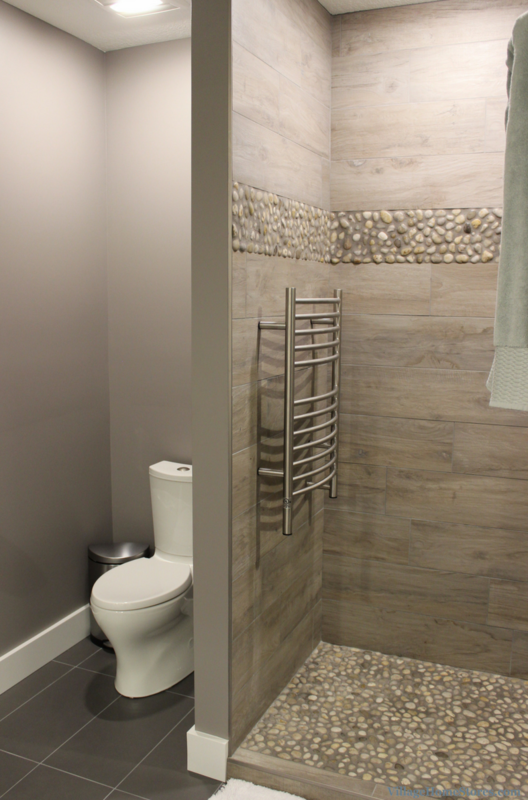 That same accent pebbled tile is used as the shower floor. 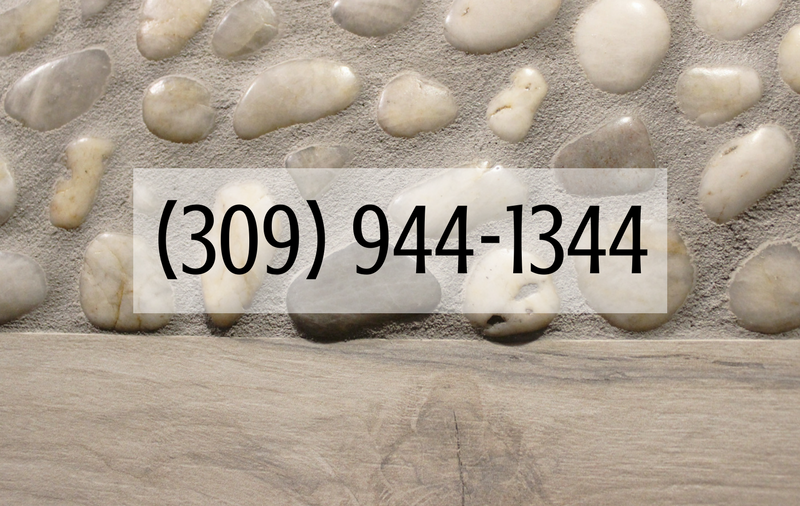 By using this textured pebble tile as the shower floor, you are treated to a foot massage every time you use it! Plus if the warm towel waiting for you isn’t enough pampering, just turn on the heated floors for you once you exit the shower. 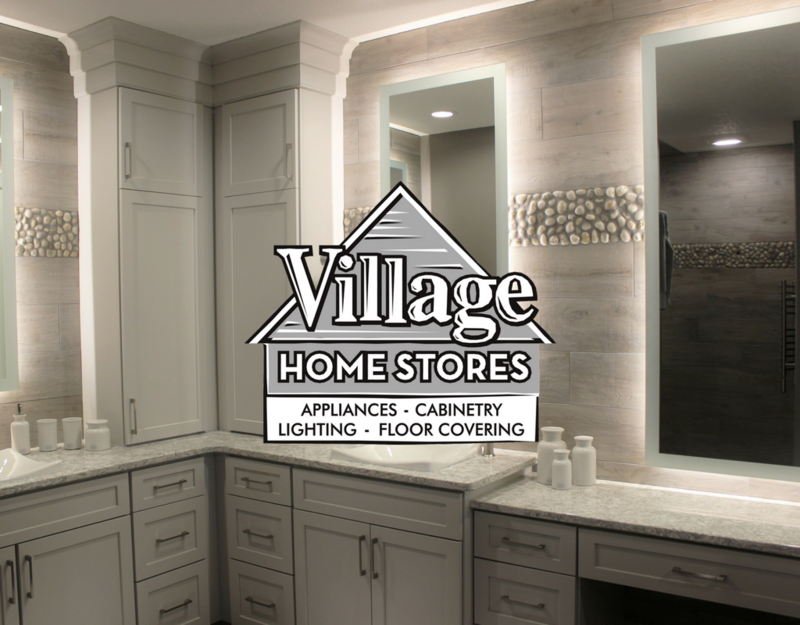 It is no mystery why we are so in love with how this bathroom turned out. 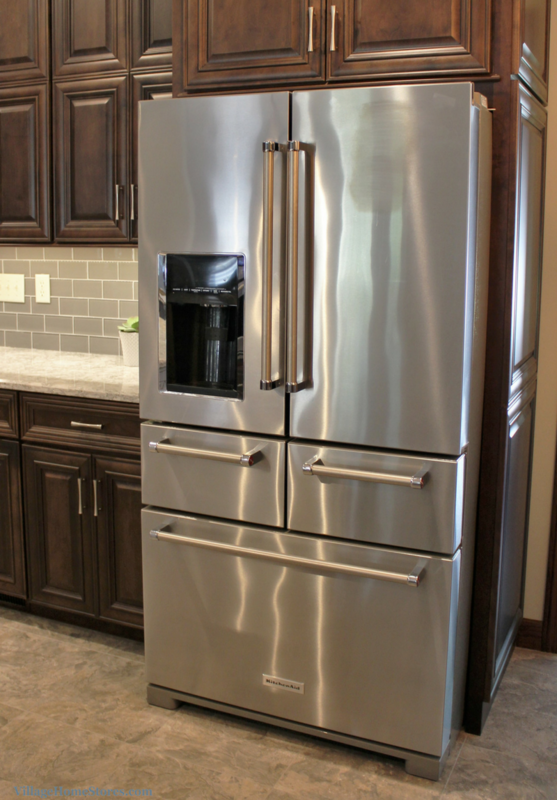 It checks all the right boxes: stylish, inviting, unique… oh and did we mention the client was just the bee’s knees?!?! 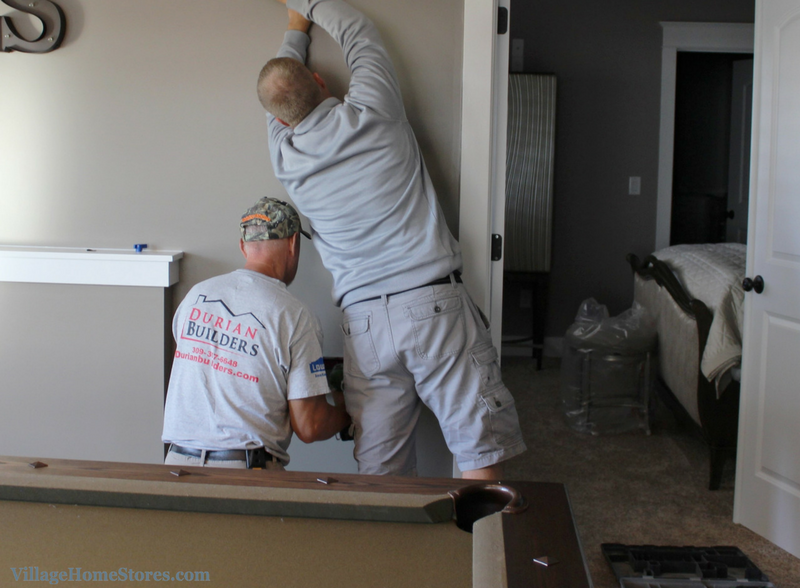 We love it when a customer is just as enthusiastic about the process and the project as we are. She was wonderful to work with on the whole project. 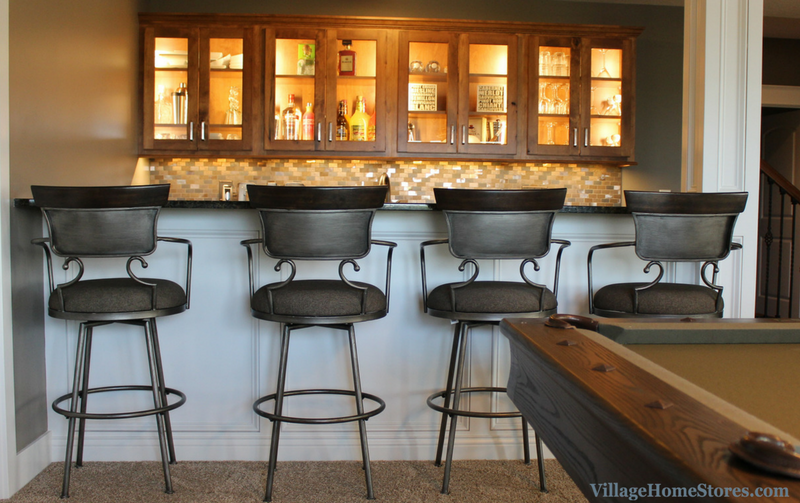 This Lower Level remodel project includes this bath, a basement bar area, craft room and home gym space. 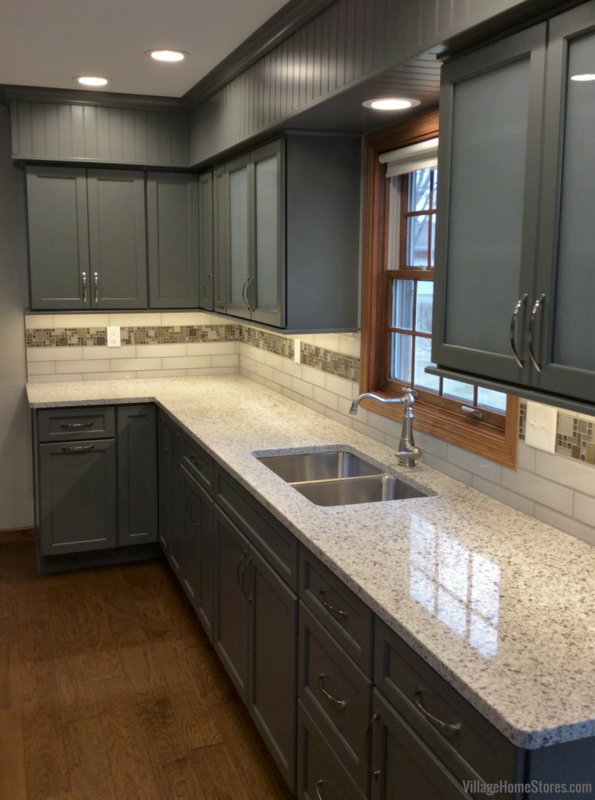 See the full project here on our Houzz page. 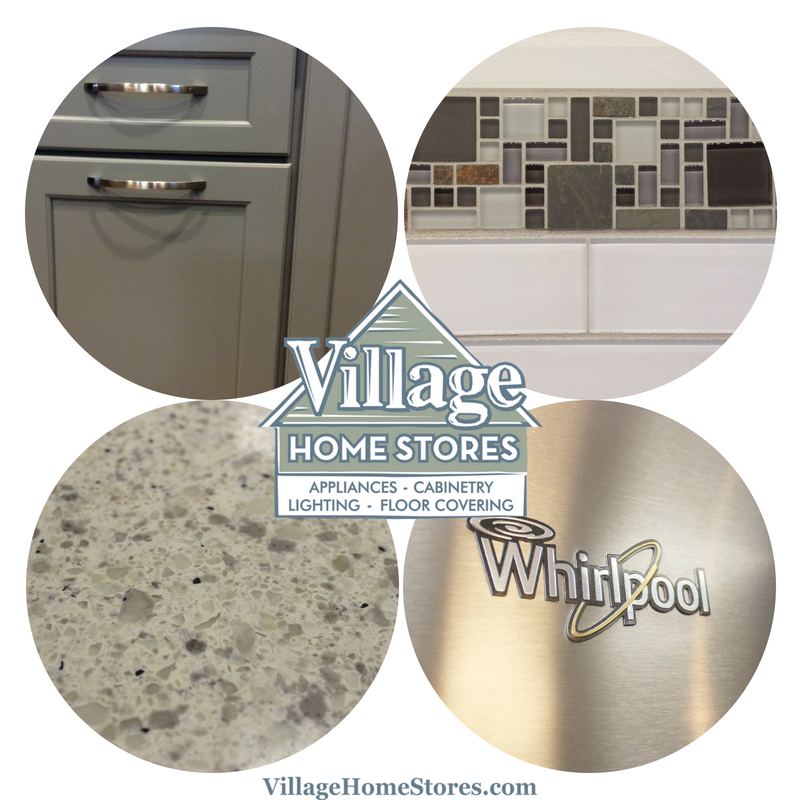 We hope to very soon feature it on an upcoming episode of the Village Home Show. Are you ready to talk about your OWN project with our store? Your first step is to reach out. 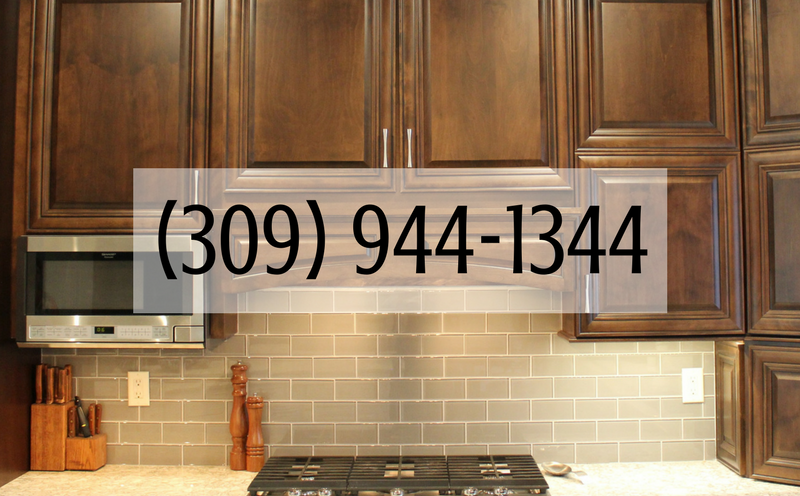 Call us at (309) 944-1344 or complete this short online form and we will walk you through our process. We can’t wait to hear what you are working on!